CALGARY – Canadian energy executives view TransCanada Corp.’s decision to scrap its $15.7-billion Energy East project on Thursday as just the latest multi-billion-dollar project cancellation in a string of abandoned energy proposals worth over $56 billion over the past year alone. Calgary-based TransCanada announced it would not proceed with its massive 1.1-million-barrels-per-day oil pipeline between Alberta and New Brunswick on Thursday after it had previously said it needed to understand the cost impacts of the federal Liberal government’s changing regulatory requirements. 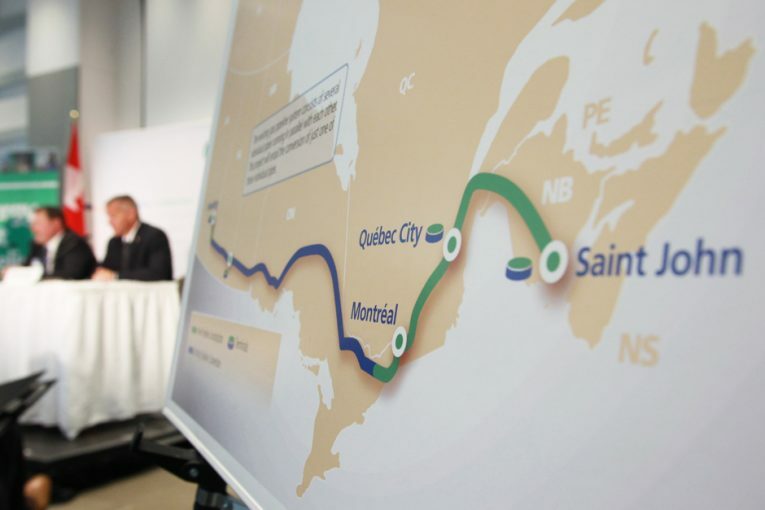 “After careful review of changed circumstances, we will be informing the National Energy Board that we will no longer be proceeding with our Energy East and Eastern Mainline applications,” TransCanada CEO Russ Girling said in a statement Thursday. Explorers and Producers Association of Canada president Gary Leach said the cancellation should be viewed in the context of other major energy projects that have not proceeded in Canada, including the $35 billion Pacific Northwest LNG project, the $5.4-billion Northern Gateway pipeline and CNOOC Nexen’s cancelled Aurora LNG project, for which costs were not disclosed. “The common thread here is that Canada generally has displayed an unwelcoming policy environment and an uncertain approval process – the rules are unclear, there are lots of opportunities to intervene and oppose,” Leach said. Major oil companies have opportunities to invest in other jurisdictions and, for both companies, investment elsewhere looked more attractive given the constant changes to Canada’s regulatory structure, he said. “For Canada, I think this is a blow. We are deluding ourselves if we think Canada is a place with a stable, predictable investment climate. These are signals that there’s something deeply dysfunctional in the legal and regulatory and investment climate that has occurred in the last few years,” Leach said. Canada’s Natural Resources Minister Jim Carr said the cancellation was a business decision by TransCanada given oil market conditions had changed since the pipeline was first proposed. But energy executives in Alberta expressed their anger over the decision. The Canadian Energy Pipeline Association, an industry group representing Canadian pipeline companies including TransCanada, called the project cancellation “extremely disappointing” in a release. “This is evidence of how a lack of clarity and an unclear decision-making process regarding pipeline projects in Canada are challenging the energy sector’s ability to be competitive in the world market,” the organization said in a release. Canada’s Building Trades Unions said it regrets the business opportunities that have been lost in Atlantic Canada, Québec, Ontario and on the Prairies. “We do not need to have the rules of the game changed in midstream. That is neither fair nor appropriate; we ought not to ask a proponent to take a multi-billion gamble on a process that changes simply because a dog barked on Upper Teacup Road,” Canada’s Building Trades Union chief operating officer Robert Blakely said in a release. The Energy East cancellation would force Canada to rely more on the U.S. to be it’s “broker” for oil and gas produced domestically at a time when the North American Free Trade agreement is being renegotiated, argued Canadian Association of Petroleum Producers CEO Tim McMillan. “I can’t think of a worse time” to be more reliant on the U.S., he said. The U.S. was the source of 54 per cent of Canadian oil imports, with Saudi Arabia (11 per cent), Algeria (11 per cent), Nigeria (10 per cent), and Norway (6 per cent), the other major suppliers last year, according to the NEB. “There’s a drumbeat today in Canada of major projects that companies, after multiple years of development and billions spent in Canada to move these projects forward, have independently said, ‘We’re done. We’re not going to spend any more money in Canada to build this infrastructure,’” McMillan said. Robert Kwan, an analyst at RBC Dominion Securities said he was not surprised by TransCanada’s decision, given that the company had sought to delay the project applications. However, the decision won’t affect the company’s dividend because its growth forecast didn’t include the project, Kwan wrote in a note to clients. News on scuttling the Energy East’ project comes as analysts pare back their projections on the growth of Canadian oil production and question whether all the proposed pipelines are needed. Canadian oil output is set to touch the five million barrel-per-day threshold around the end of 2018, from 4.7 million bpd last year, according to the International Energy Agency. TransCanada is waiting on final approvals in Nebraska for its US$8 billion, 830,000-bpd Keystone XL pipeline, which will carry crude oil from Alberta to the U.S. Gulf Coast. Competing pipeline projects, including Enbridge Inc.’s 760,000-bpd Line 3 replacement project and Kinder Morgan Canada’s 590,000-bpd Trans Mountain expansion project, have been approved by the Liberal government and are moving forward. Both projects are expected to be in service by 2019 to ease a pipeline shortage facing Canadian oil companies. A recent note from Calgary-based AltaCorp Capital suggests producers will be short on pipeline capacity till Line 3 and Trans Mountain come online, which will provide the extra capacity needed until around 2030. However, both projects face intense opposition and could still fall by the way side, analysts say. Dirk Lever, an analyst at AltaCorp Capital in Calgary, said TransCanada was likely struggling to lock down shippers on its Energy East pipeline, who had overbooked their positions on future pipelines when oil prices were riding high. Even so, the ideal pipeline system would be running below capacity to provide shippers more options without depending on rail. The decision to nix Energy East will also restrict buying options for the Irving Oil Ltd. refinery in New Brunswick, which currently depends on imported oil for its feedstock. Irving was a joint-venture partner in the Energy East project. “What you need is optionality and the optionality has been taken away completely,” said Frank McKenna, the deputy chairman of Toronto-Dominion Bank and former New Brunswick premier. Irving didn’t respond to requests for comment, but the company’s president Ian Whitcomb said he was “disappointed with this decision” in a written statement Thursday.